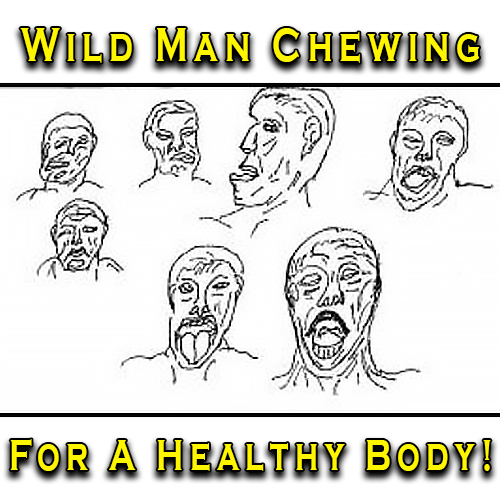 In this post I will tell you about Wild Man Chewing for a Healthy body. Even how you chew can help you. Wild Man Chewing is easy and fun. The face muscles, too, need exercised. We do not do enough “Wild Chewing.” A few minutes of aggressively chewing each day will also enhance the contours of faces. Pretend that you are a wild animal: snarl, grow, roll your head around and snap at flies. Have fun and don’t be embarrassed. Be cautious at first because your neck may have unhappy feelings –like gravel rolling around. This is caused by the ligaments that keep the neck bones from slipping and sliding around—they are tight and lazy. These tough ligaments need exercised to stay flexible and healthy. Ligaments and joints are lubricated by the bursa sacks that are between the bones. Without them your head may slide off your Atlas Joint, and the atlas vertebrae need their workout to stay strong as well. My face and neck don’t get enough exercise. My cheeks, jaws, mouth, tongue, eyelids, lips, nose, soft palate, neck and vocal cords are lazy and weak. When I chew my food, then my taste buds tell my digestive track what is coming. This is important because the stomach must get ready for the important job of digesting and sending the food to the intestines. The intestines have thousands of taste buds that help decide whether to send it on down or force regurgitation of bad food. Also, we have taste buds in the colon too. Taste buds are merely chemical identifiers, without these we could not survive. This process began away up in the mouth and thereby prepared the body for what was coming down the tube.